In My Shower - OGX Renewing Moroccan Argan Oil Shampoo & Conditioner! The OGX Renewing Moroccan Argan Oil Collection has a moisturizing formula that includes a lightweight, fair trade argan oil from the southwest region of Morocco- a powerful antioxidant that is rich in vitamins to instantly penetrate the hair shaft restoring shine while strengthening, increasing hair's elasticity and protecting from UV damage while leaving the hair soft and silky. 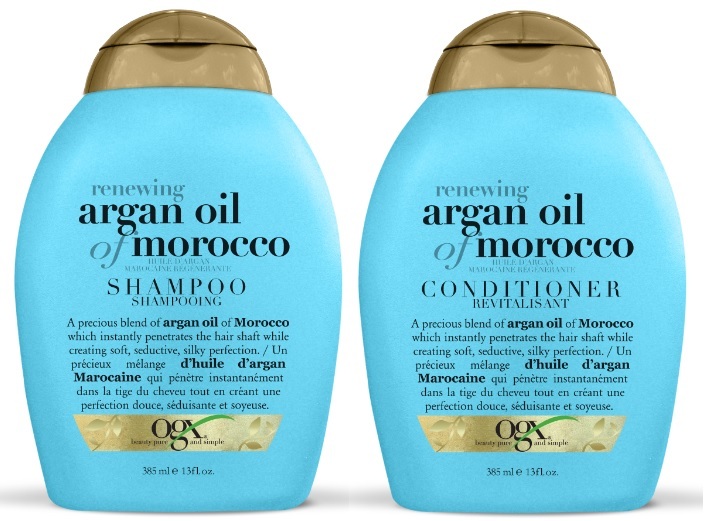 OGX Renewing Moroccan Argan Oil Shampoo & Conditioner - 385ml - $9.99 - with a sulfate and paraben free formula that restores moisture to dry hair and stimulates the scalp to create a cleansing and rejuvenating experience that is even safe for coloured hair. I have fine hair so oil products make me a little nervous - for most of us the word "oil" brings to mind something that is heavy and greasy - not to worry though, the formula is light, smells great and leaves my fine hair soft, silky and bouncy light! Renewing Moroccan Argan Oil Intense Moisturizing Treatment - 237ml - $9.99 - use once or twice a week for 5-7 minutes to restore hair's inner health and add brilliant shine with a blend of enriching organic active ingredients. Renewing Moroccan Argan Oil Penetrating Oil -100 ml - $9.99 - an ultra-light oil that fights frizz and moisturizes brittle hair - and when used on wet hair, reduces blow drying time. Available now at Shoppers Drug Mart, Walmart and Target stores across Canada.